May 26, 2016, © Leeham Co.: A softening of trans-Atlantic air traffic, with declining yields and passenger demand, raises anew concerns that there is an oversupply and over-ordering of twin-aisle aircraft. Air Lease Corp. addressed this concern at its May 19 investors day, arguing that growth plus retirements over the next 25 years more than supports the orders. 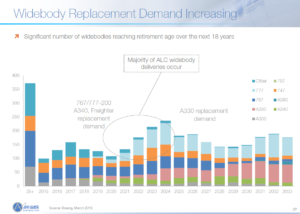 ALC, which is headed by Steve Udvar-Hazy and John Plueger, considered two of the leaders of the lessor industry, note that there is an average of about 150 wide-bodies approaching 25 years in age each year for the next 20 years. 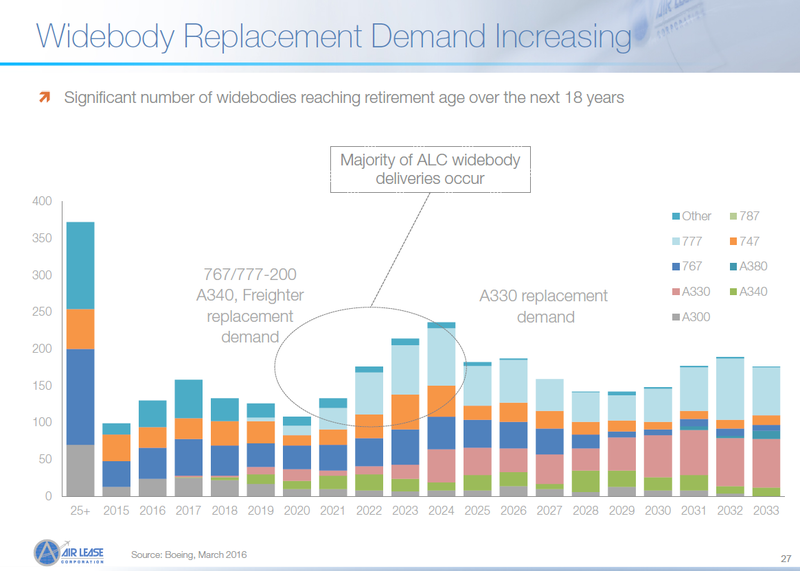 Coupled with long-haul traffic growth, ALC—which has a modest number of wide-body orders—is comfortable with the future supply-demand. We’ve dissected the known delivery dates of wide-bodies at Airbus and Boeing, using the Ascend data base as of January. Wide-body orders have been announced subsequently, but not all have been firmed up and the total number won’t materially affect the trend lines. Figure 1. Source: Air Lease Corp. Click on image to enlarge. We look at announced production rates by 2020 of Airbus and Boeing. We don’t include our own forecasts. We look at the defined delivery dates of the A330, A350, A380, 747-8, 777 and 787. These are all models, including ceo/neo and Classic/X. We look at factors that indicate a softening of wide-body demand across the Atlantic.